Starting from the 1500’s the wealthiest families began to collect works of art and to commission new ones to the leading artists of the time. Today those collections belong to the State and are opened to the public. 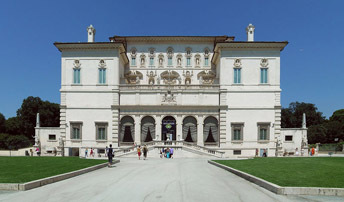 Surrounded by lush vegetation lies The Borghese museum with one of the most stunning collection of works of art in Rome. Cardinal Scipio Borghese was an ardent collector of antiquities but he also had the most famous artist of the time to work for him. Lorenzo Bernini’s early works were for the Cardinal: Apollo and Daphne, Pluto and Persephone and the David, as well as portraits of the Cardinal and his powerful uncle, Pope Paul V. The Collection also boasts paintings from Caravaggio, Raphael and Tiziano. Right in the heart of the Trastevere neighborhood Villa Farnesina, is not to be missed. Built in the early 1500’s for Agostino Chigi, the banker of the popes, probably the richest man in his time. The architect Baldassarre Peruzzi built the villa while Raphael and his school frescoed the interior. The Pamphilij-Doria Gallery along Via del Corso still houses the richest display of masterpieces from Caravaggio to Velasquez to Tiziano still owned by the same family from the 16th century.